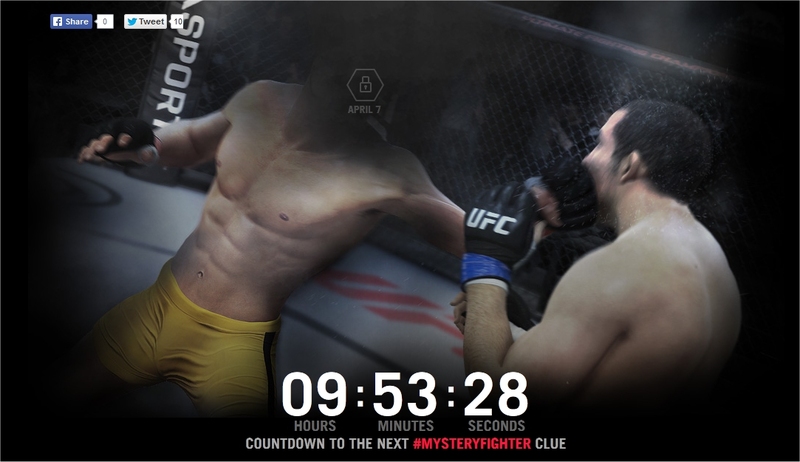 EA has rolled out five clues for their mystery fighter to appear in their upcoming EA Sports UFC game for both the Xbox One and the PlayStation 4. Over on the official EA Sports Twitter account, they've been unveiling some new details on who the mystery fighter is. The clues are definitely mysterious but the main image of the fighter definitely seems to indicate at every possible measure that it's Bruce Lee. Check out the promotional image below that EA has been touting for the mystery fighter. So what in this image hints at Bruce Lee? A couple of things: Yellow and black trunks like the ones Lee wore in his unfinished film Game of Death. Also, the backfist he's pulling off in the picture is move rarely ever used by today's UFC fighters. The underhand backfist was something Lee was notorious for pulling off in his movies Another thing is that the initial hint was that he never fought in the UFC, which is completely true – although, Lee did fight for real throughout his life. Another clue is that he would classify to fight in four different weight classes. Lee did range between 130 and 160, which would mean that – as the image shows below – he would fit into the bantamweight, featherweight, lightweight and welterweight classes. One of EA's other hints was that he was born in America, and Bruce Lee was born in San Francisco, California. So that applies. Another hint was that “two colors” are all you need to figure out his identity. It seems to be a dead giveaway... but then again, maybe it's Bruce Li or Bruce Lei? Anyway, Good Game Bro also seems to believe that Bruce Lee is definitely the mystery fighter. All roads seem to point to this path. Now some of you might be wondering “Why is a movie actor being included in a real-life UFC game?” Well, maybe because that movie actor was actually an accomplished real-life martial artist and was the father of what evolved into today's MMA scene. Mixing martial arts for a “pure” fighting philosophy was what Lee was all about. He even demonstrated such versatility with his ground game in original Enter The Dragon... against Sammo Hung! Now I'm going to be flatout honest: If Bruce Lee is truly in EA Sports UFC, then I will have no choice but to by the game. It's just too awesome to pass up. Besides, the last time I can remember Bruce Lee being in a video game was the one based on the movie Dragon: The Bruce Lee Story that starred Jason Scott Lee. That was decades ago. I just can't wait to see how this all turns out. Also, for the next game, EA needs to work on securing the services of Donnie Yen... oh crap would that be awesome. And maybe, for the third game, Jean-Claude Van Damme... because he was also legit back in the day and had an impeccable tournament record. While EA Sports UFC won't be arriving for the Wii U, it will be available on the PS4 and Xbox One starting in the late spring.